Many readers may recognize the kind, soft-spoken woman who frequents the entrances to the New Seasons and Walgreens stores in Concordia. Few are likely to know her name, or much else about her. She’s often seen sitting on the sidewalk, hand-written sign requesting help in hand, and one or two tail-wagging dogs flanking her side. 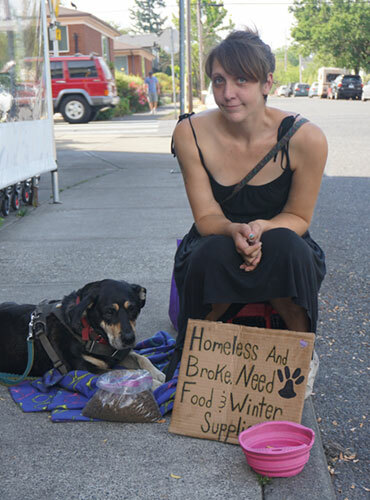 Her name is Ashley, and she’s one of more than 4,100 people in Portland who are homeless. Ashley has been homeless on and of for the past 10 years. She first became homeless after being kicked out of her home her senior year of high school. She’s been in Portland for the past 1½ years, having moved from Eugene. Along with her partner, Matt, and their two dogs, Medusa and Monoose (like “mongoose” without the “g”), she spends most nights at a nearby, makeshift campsite. One friend occasionally lets the four of them stay with her. Ashley’s eyes light up and a faint smile spreads across her face when she talks about her dogs. Both share Ashley’s friendliness, and both have endured – and survived – significant health challenges, thanks to Ashley’s care and dedication. Dan Werle lives in Concordia with his wife, Anna, and their dogs.